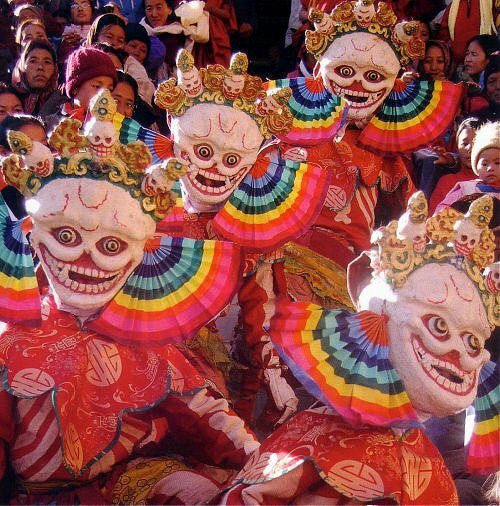 In a land maimed since 1950 by Chinese occupation, by mass killings and displacement, the Cultural Revolution, with its wholesale destruction of all things old, struck at Tibet's heart. Amid the executions and 'struggle' sessions, all public vestiges of Buddhism were erased, the Buddha denounced as reactionary, sacred images tossed into latrines, and scriptures converted into shoes for disgraced monks. By 1976, out of more than 6000 monasteries and temples, thirteen remained. One of the any great monasteries destroyed in the Cultural Revolution was Tashi Lhunpo, which lost many of its precious scriptures, statues and images. Of the six thousand monks in the monastery, only two hundered and fifty were able to follow the Dalai Lama into exile, yet in 1972 under the patronage of the Dalai Lama, Tashi Lhunpo Monastery was re-established at Bylakuppe in the south of India. The Panchen Lama is the spiritual head of the Tashi Lhunpo monastery and the second most important figure in Tibetan Buddhism. 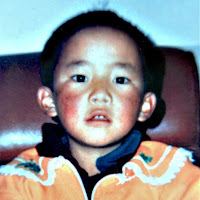 In 1989 the 10th Panchen Lama died unexpectedly after delivering a groundbreaking anti-Chinese speech. The lineage then passed to Gedun Choekyi Nyima, the six-year-old boy identified by His Holiness the Dalai Lama as the 11th Panchen Lama. But in May 1995 Gedun Choekyi Nyima disappeared and suspicions that he had been kidnapped were confirmed in May 1996 when the Chinese leadership admitted to holding him and his family in "protective custody." "All the lamas of Zhaxi Lhunbo (Tashilhunpo) Lamasery, including myself, and the believers should love the Communist Party of China, love our socialist motherland and love the religion we believe in,"
Degenerate Music from the land of the iPhone comes in the form of Time of the Skeleton Lords - the latest in a series of CDs made on location at the Tashi Lhunpo monastery in exile as a joint venture with the 30 IPS label. This new release traces the journey of the consciousness through Bardo, the intermediate period between death and rebirth. Recording and mixing were in the very capable hands of Mark Tucker whose other credits include the Spice Girls and Dario G. Not so long ago this kind of recording would be of interest only to ethnomusicologists. 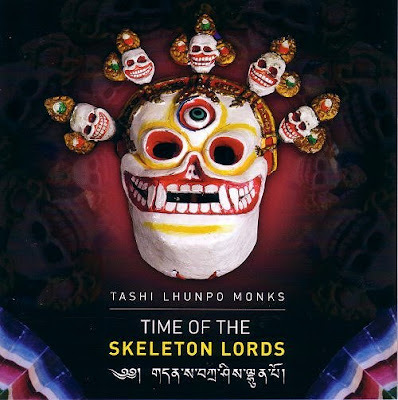 But the quality of today's solid state portable recorders and the involvement of a recording professional means the Tashi Lhunpo release tick the sonic as well as ethnomusicological box - the visceral sound of the dungchen (long horns) establishes a direct lineage to Jonathan Harvey's Body Mandala. More on the Tashi Lhunpo sound in Wagner and the Tantric Orchestra. * January 27th is Holocaust Memorial Day here in the UK, an event dedicated to learning lessons from the past and using them to challenge hatred and persecution in the present. 'Entartete Musik from the land of the iPhone' is one of several articles that will remember acts of hatred and persecution that have also become victims of collective amnesia. Again, thanks for reminding us of the relationship of music to the horror. The Armenian genocide has in fact featured here a number of times - http://www.overgrownpath.com/2007/08/alan-hovhaness-mysterious-mountain.html while Friday's article remembers another overlooked European humanitarian tragedy.